Viral Shark Video Roundup For 2017 - We Love Sharks! Viral Shark Video Roundup For 2017 - We Love Sharks! Our shark video roundup captures viral footage from the shark world in recent times. If you are looking for real videos that show what’s been going on in the shark world recently then this one is for you. Our viral shark video roundup for 2017 includes some of the most remarkable and astounding footage from scenes involving sharks at different locations worldwide. Some were found in unexpected locations, some were filmed for the first time, while one in particular shows the gross disregard some people still have for sharks. Back in May this year, we brought you the story about the Pointy-Nosed Blue Chimaera or Ghost Shark filmed for the first time ever on camera. This shark had been previously discovered in very deep waters off Australia, New Zealand, and New Caledonia, but is so elusive that it hadn’t been filmed. The lucky footage happened through a camera mounted in a remotely operated vehicle. The shark bumped into the camera several times and appeared fascinated by the device at a depth of about 2,000 meters (6,700 feet) in waters near Hawaii, USA. Uploaded on Youtube by National Geographic. This shark video shows some of the breathtaking beauty and lifeforms that exists underwater. While researchers were studying biofluorescence in corals and smaller fish, they noticed a shark that reflects certain light. To date, they are still studying it to get more specific information about it. In June this year on the Pacific Coast (Baja, California), a couple of friends got what must still be the shock of their lives when they sighted a massive creature thrashing about in shallow water. It was a great white shark but sadly it appeared to be badly injured and probably sick. The shark video went viral not just for the footage but some of the colorful language used in the commentary by the stunned men. After seeing the video, marine biologist Michael Dormier agrees with the assumption that the creature must have entered into shallow waters to hunt for stingrays. 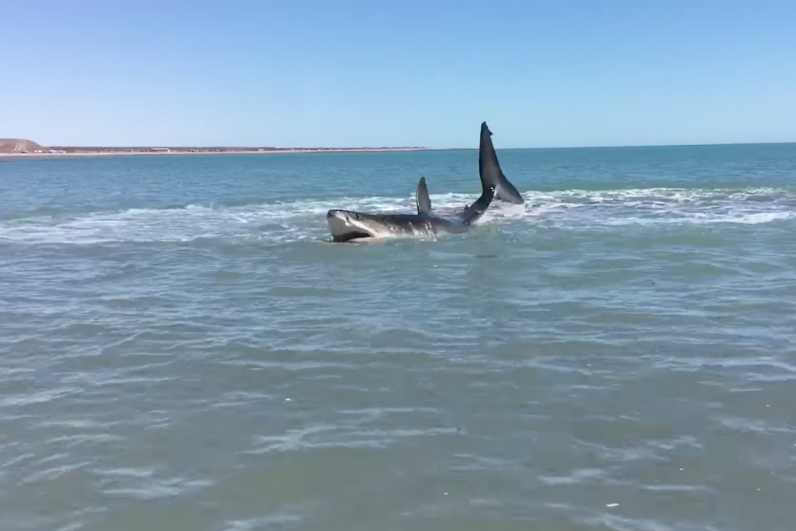 The men were able to get very close to the shark because of the about 3-foot deep water. Also, they beleive the severe injury just behind the dorsal fin was likely caused by a boat’s propeller. Also in May, we told you about the Kavachi Volcano Sharks inadvertently discovered by a team led by NatGeo explorer and ocean engineer Brennan Phillips. The expedition took them to the Solomon Islands to investigate hydrothermal activity around the Kavachi Volcano. However, they found much more than what they were expecting. Among which was the discovery of sharks in the volcano. Their camera captured hammerheads and silky sharks living in the acidic and very hostile environment in and around the volcano. Honestly, this has got be one of the most outrageous and irresponsible demonstrations of human behavior ever. It shows two men having a laugh while dragging a shark behind a high-speed boat off the coast of Florida, USA. They even went ahead and uploaded the video on social media. As a result of this reckless display of cruelty, the video went viral with people and animal conservation bodies calling for their arrest and persecution. Governor Scott in a letter to the Florida Fish and Wildlife Conservation Commission (FWC) restated that Florida must strictly prohibit “such inhumane acts.” The individuals were later identified but the FWC did not release their identities to the press. A diver in waters off the coast of Indonesia was surprised to see one of the rarest sharks ever swimming past him. In fact, this shark species, the megamouth shark is so rare that just about 100 of them have ever been sighted. That’s since 1976 when they were first discovered to date. There is still so little known about megamouths because of their elusive nature. 7) Do Sharks Like To Be Petted? Jim Abernethy is the owner of Scuba Adventures, an ecotourism business in the Bahamas. Though words like “love” and “affection” are not commonly used by most people when describing sharks, Jim appears to have developed a loving relationship with tiger sharks in the neighborhood. And according to Jim, sharks like to be petted like dogs. This shark video shows a special “reunion” at Tiger Beach in the Bahamas between Jim and a particular shark named Tarantino. Have you seen other viral shark videos lately? Let us know in the comments.